In a last minute creative settlement, the city of Seattle fired the entire NBA for the moment - fired the owner, fired the players, kept their beloved team name, and got up to $75 million for doing it. A new NBA team will play in Oklahoma City next year. But they won't be named the Supersonics. Seattle has until the end of 2009 to put together a new arena plan and rebirth the Sonics franchise. The press is calling this a victory for Clay Bennett. Heh. So it comes out today that the Sonics owner has been lying all along about his plans to take the Sonics from Seattle to Oklahoma City. Now, suddenly, this is the top political issue for Governor Gregoire's political campaign. Who'd a thunk it? Last time we had the wackiest gubernatorial campaign of all time and now it's gonna be cluttered with roundballs. More the merrier I guess. Just watch, somehow basketballs are going to be used in the counting of votes! So what kind of league is the NBA? If it can happen in the 15th largest metro market can it happen in yours? Among the many important things that were happening today, one VERY important event happened. A local group has put together a deal to keep the Sonics basketball team in Seattle. A lot will depend on the legistature and the league - but it seems like the pressure is on at this point. During my last trip to Japan, while in Osaka, I was treated to one of the most unique and honoring experiences I have ever had. My joint venture partner took me to observe Sumo practice. 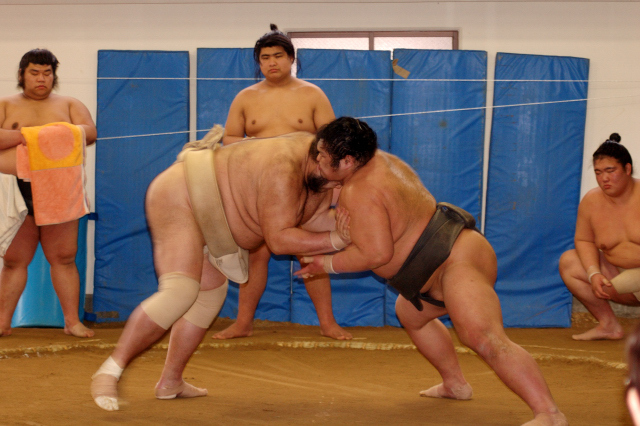 Perhaps most of us in the west have significant preconception about what Sumo is. We likely subconsciously connect it with our own sports experience and associate it with what we know about western professional sports. Most all of these preconceptions aren't true. I quickly learned a set of facts which quickly disabused me of my western notions. Sumo is more of a team sport than an individual one - it's not like our tennis is or golf (with an individual supported by their own courtege) as we might suppose. As with most things Japanese - there is a collective effort, a group think, each combatant an extension of his peers. Each Sumo stable (as they are called) is associated with a Buddhist Temple - and would be rather like us saying: "The Green Bay Packers are associated with the First Baptist Church in Green Bay". Most of the Sumo stables (there are 56 if I recall correctly) are home based around Tokyo, but there are six major tournaments a year at different locales (the Osaka tournament was coming up when I was there) so they move en masse to sister Temples near the city where the tournament is taking place. Located on the premises of the Temple is a practice area, which, in our case, was a loosely set up canvas and tarp tent, with the sacred circle contained within. Sumo athletes pretty much lead a monastic existence. They begin practice every day at 5 AM - that's 365 days a year - and they practice until noon or so. They then eat a huge meal and rest for a little while, do some chores around the Temple, perhaps go to the market, and then in bed around 5PM - they sleep 10-12 hours a day because of the intensity of their training. They buy and prepare their own food. Most of them don't make much money. All of their winnings in tournaments are given to their stable - for those who are very successful, some amount of their earnings are returned to them. A career may last ten to fifteen years with this kind of existence. After their career, those that have made a name for themselves are some of the most honored citizens in society - some living their days out like royalty. Most go to work somewhere in Japan society or stay associated with the sport as a trainer or coach. Though there is an official Sumo organization, it is focused almost completely on the sport's tradition - there are no significant commercial efforts for the kind of lavish corporate sponsorship and commercial television contracts that our professional sports are pervaded with. In fact, it appears that in many ways Sumo is a sport that remains financially 'wanting' because the sport depends almost completely on tournament winnings and donations. ...Continue reading "The Heart of Sumo Part 1"
Or is it: Mike's got the trots? Prerequisite. This is the second in a multi-part series on the NFL's defense of the poor officiating in Super Bowl XL. Now we move on to what is one of the most controversial non-calls in Super Bowl XL. That's right, nothing was said about it at all. Not in the interview, not in the clips. Not discussed. What am I talking about? I've already discussed this to some extent here. What is it? It's the long Steeler's pass play to Hines Ward in the second quarter that set up the touchdown by Roethlisberger. Some commenters have been blasting my posts here in reference to this non-call because 1) I didn't show enough still frames to demonstrate the infraction, 2) There is colloquial leeway in the call that allows for imprecision in the call, or 3) I don't know the rules. Hopefully this post will meet the sufficiency tests, though I suspect that, despite absolute proof, some people are incapable of altering their views. This is the beginning of the play. The line of scrimmage is just about exactly the 40 yard line. Maybe a little over. Here we are near the end of Roethlisberger's scramble. Max Starks is more than one yard beyond the line of scrimmage. He's not engaged with a defensive player - nor is he within this sequence. I'm not going to show every frame - maybe every couple of frames - Ben's looking, Max continues forward. ...Continue reading "Or is it: Mike's got the trots?" It seems like every time I come to Japan I get here just in time for some over-the-top sports celebration. Arakawa-san really skated the only fault free round in the replays I've seen. Of course, since I've been here (really just for a few hours now), I've seen her free skate on pretty much every channel at least five or six times - and two live interviews so far. This nation is going berserk once again! They had assemblies of hundreds of people at movie theaters, karaoke bars, and whatever passes for sports bars here - all wearing Japanese flag adorned headbanks and waving Japanese flags. They were from every age group and socioeconomic strata - and their jubilation is just another one of those strange Japanese things that never ceases to amaze me. Arakawa-san delivered a technically brilliant and elegant performance. Every other contender (including American favorite Sasha Cohen) fell. It's the first medal of these Olympic games for Japan. 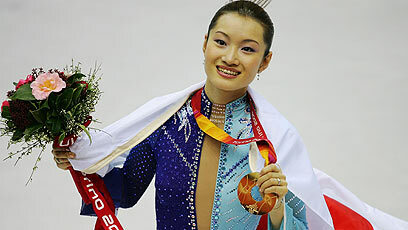 And it's the first Gold Medal for Japan in women's figure skating in history. Even if no self-respecting Japanese person would ever think of becoming the spittle covered, flag wrapped, business suit torn, idiot faced, should be committed to an institution for demon possession minion that I've seen by the thousands on TV today - I say let 'em go crazy. This is an historic moment. Besides, they are hilariously funny to watch. God Bless 'em. The furor over Super Bowl XL continues to rage unabated. So much so that the NFL decided to trot out Mike Pereire, Director of Officiating to do a stint justifying the bad calls in the game (he's pretty much been missing in action until this show late last week). 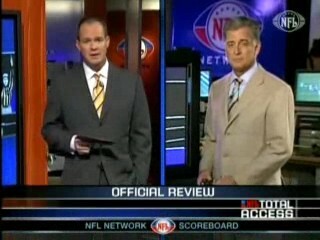 You can watch the clip of NFL Total Access Official Review here. As you can see in the clip, Mike runs the play (near the catch) back and forth a few times and talks about how this must be offensive pass interference because Jackson uses his arm to obtain separation from Hope. What he doesn't say, and what his shill interviewer doesn't pin him down on is that Jackson didn't initiate the contact with Hope in this segment. Here they are before their final contact before the catch. (We'll avoid discussing whether Hope's contact is legal here, because there's a lot more interesting stuff coming up from Mike on that). Jackson is behind Hope on the field. No one is in contact here. Jackson is avoiding Hope. Hope is reaching for Jackson. Hope initiates contact with Jackson. He has reached out with his right arm and is chucking him on the left shoulder in the end zone. ...Continue reading "So they trot out Mike"
This has become the flag (well the penalty flag) waving mantra for Super Bowl XL. Even Seahawks players have been soundbited parroting this drivel so as not to sound like they are whining - and so that they don't get fined. I've been investing a little time here and there lately capturing what I can of the game. I know that the game is completed and I know what the result was. I remain unsatisfied with the NFL's obligation to its fans to provide a fair game. Until that's corrected, I'm going to continue to call them to account. Here's another microcosm of a play with video frames again. These events occurred right in front of billions of people in the light of day (or night I suppose). In this microcosm, what does 'not play well enough' mean? Here we are at about 10 minutes left in the second quarter. 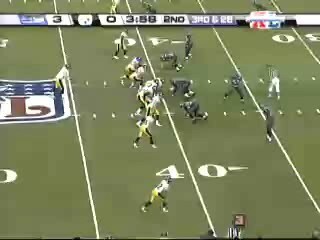 Roethlisberger has made a long pass attempt to Randle El. Seahawk defensive back Michael Boulware leaps up to intercept the pass. Leaps? Actually he flew - for a little while. In one of the most athletic plays imaginable, Boulware instigates a change in possession - not really a mistake by Roethlisberger - and it could have been a spectacular gain for Pittsburgh inside the red zone. There are some basketball players that can execute something like a 42 inch vertical jump. There are probably only a handful of athletes in the world that could do what Boulware did here. This is one of the most extraordinary images I have ever witnessed in all of sport. At this moment billions of eyes must have been transfixed on what was happening here. But, not only has he elevated to this extraordinary height, he has taken possession of the ball - and both he and Randle El realize that he must keep possession all the way to the ground. In this case that's a long way down and a relatively long time. Randle El's reaction is to attempt to dislodge the ball in the most aggressive way possible - he can't reach the ball - Boulware's clearance above the ground exceeds the height of most human beings - so Randle El goes for his head. In this frame you can see that Randle El has twisted Boulware's neck far to the right with his left hand clasped over Boulware's face mask. At full video speed this is a vicious snap. Not as well in view until they approach the ground - Randle El's right hand has been jammed against Boulware's face mask as well - and as they approach the ground Randle El uses his right hand to slam Boulware's head into the ground to attempt to dislodge the ball. Granted that this happened pretty fast - and Boulware's athleticism was amazing. But, Randle El's actions are among the most egregious that you could ever witness on a football field. I could not have been the only fan that observed this - but that's not the point. Given the extraordinary circumstances of this play, it had to have been observed closely by one or more officials - and there was no call. No flag. No fifteen yards for facemask, unsportsmanlike conduct, or unnecessary roughness - all certainly qualified here. Now, before you whinegangsters get going, I'm not suggesting that this non-call affected the outcome of the game - there are plenty of those to deal with. Sure there's something to be said about starting from the 32 instead of the 17. Perhaps it wouldn't have been a three and out because of that. That's something we'll never know. No, what's important about thinking about this play is: Did Michael Boulware play well enough to 'win' on this play? There isn't any question about that. He did affect a change in possession and so he 'won' in that context. Did he win in the context of the rules of football? No, he didn't. He was fouled in one of the most egregious ways possible. He could have been terribly injured because of the foul. The league and the officials are obligated to penalize the offender for these infractions. But they didn't. Something we can be certain of is this: Officials observed, in real time, both the amazing athleticism and the egregious foul on this play. No penalty was called. The NFL has publically stated that no mistakes were made by the game officials. We have the right to ask and the right to expect an answer to "Didn't Michael Boulware play well enough to win on this play? How and why was something like this allowed to happen?" So, you're not going to let this go, huh? Nope. Fans require a fair game. We're going to fight for that. This week the NFL announced a new logo for the upcoming Super Bowl XLI in Miami, Florida. A spokesperson for the NFL said "We know there was a lot of confusion about what kind of game we run for the most important sporting event in the world. We designed this logo to be clear about that." The design firm PP&P designed the logo and a spokesperson for the firm said "We noticed how the official penalty flag and the Steeler's Terrible Towel are nearly indistinguishable, and thought that they nicely complemented the reflection of the sunshine on the Miami skyline." "It is our hope that everyone will look forward to next year's game", said the NFL spokesperson. "There is a lot of suspense about whether it will be three or four officiating calls or non-calls that will determine the outcome of the game", the spokesperson added, chuckling, "We hear that a whole new set of wagers are being developed to generate fan excitement in this regard."